Editor’s note: This post was adapted from a longer piece originally posted on Jen’s Blog on the Norwood School District’s website in April of 2016. We have wrapped up the last of our Livewell@School Food Initiative program and couldn’t be more thankful for the opportunity to have participated. 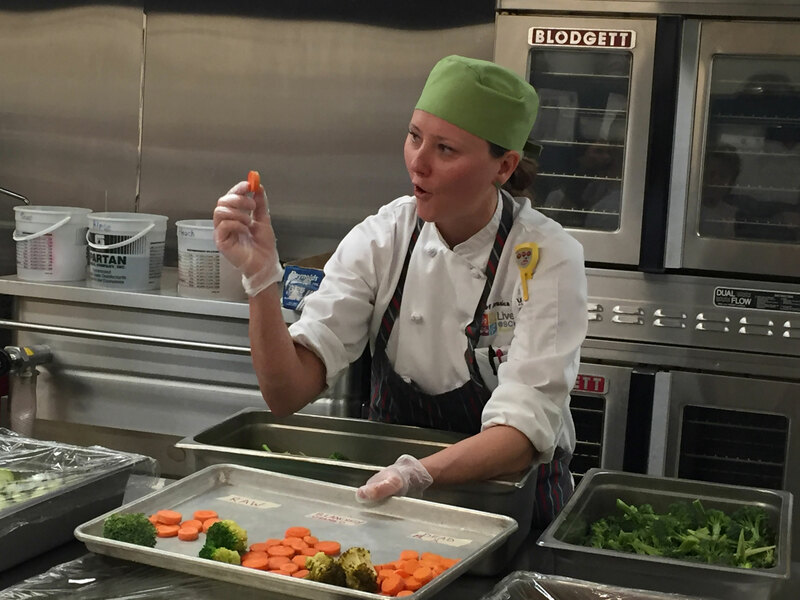 The on-site trainings and chef visits were so incredibly valuable to our program. The last visits happened in March and entailed the chefs getting face to face with students in the lunchroom and elsewhere around the school to teach them the difference between fresh, from scratch foods (like we make every day at school) and processed foods that have been so predominate in our culture for generations now. Elementary kids saw what goes into our homemade mac & cheese and compared it to a microwavable version commonly seen on store shelves. The reactions stirred up quite a bit of wonder and some humorous comments from students. Now, we know that it’s not always possible to make from scratch meals at home each night, but our objective is to educate the kiddos on what the difference is and why we are committed to offering those scratch made options at school daily. The following day was a chance for our chefs to help us introduce a new menu option and sample it out to our patrons. The surprise ingredient…peas! Spring Pea Guacamole (and yes, it is delicious)! It was so well received that it has become a regular menu item on our salad bar on Wednesdays. The little ones weren’t the only ones to be schooled by our chef friends… the secondary school also got a lesson in sugar and how much those little calorie counts can add up over time. They also got to give a little input in the form of a survey about our school meal program. Overall, the feedback was positive! We got some answers about their most and least favorite menu options and we have listened! We have adjusted our menu for the remainder of the year to include favorites like pizza and sandwiches more often and, at the request of our administration, are planning some grab and go picnic lunches as well as the weather becomes nicer. Reimbursable meal options are available for field trips and sports trips as well. Just let your child’s teacher know a couple of days in advance, and we can have a sack lunch ready to go on field trip day! Meals will be charged just the same as any regular lunch day. Another benefit to our LiveWell@School Food Initiative program was some operational consulting and assistance from the fine folks at Lunch Lessons, LLC. Nancy Howatt and Beth Collins were able to come into our school and observe daily operations and management. Nancy provided us with some helpful tracking tools and advice and Beth wrote a summary of where our strengths and weaknesses were from an operational standpoint. We have taken this advice to task and have recently applied for and received a USDA equipment grant in the amount of over $26,000! 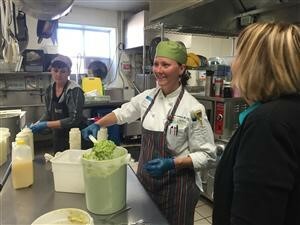 We will be using these funds to acquire and install a new walk-in freezer outside of our current kitchen and will convert the old freezer into more refrigerator space to more efficiently prep, cool and store fresh food for our incredible meal program. We are very excited and want to shout out our thanks again to LiveWell Colorado for providing us with these invaluable resources! Whew! Well, I think that’s everything.